Fig. 1 Alfred Steiglitz. 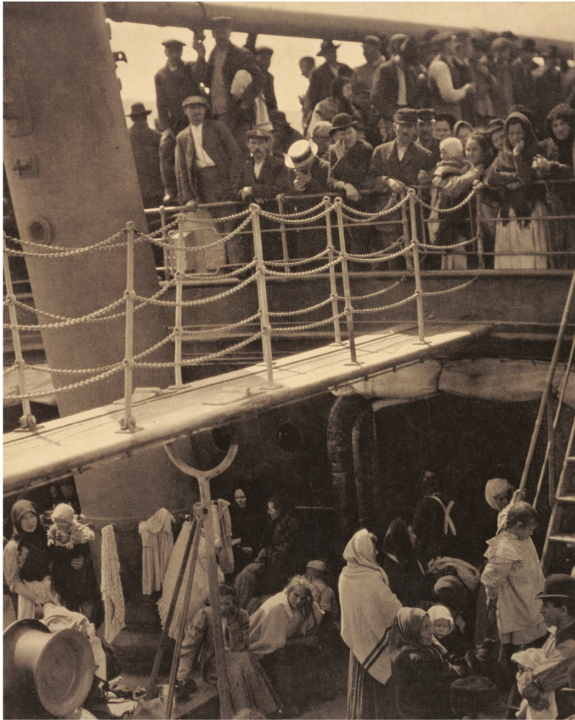 The Steerage, 1907. Photogravure print, 10.4 x 13.1 in. Courtesy of the Getty's Open Content Program, via Google Arts & Culture. Whether human or animal, migration is provoked by two urgencies: a need for sustenance and escape from oppression. Bound as it is to a yearning for homeland, Jewish history begins and continues as a story of many migrations. After renouncing and breaking his father's idols, Abraham (then still Abram) is instructed by God to move "to a land that I will show you." With this first departure, the patriarch leads his extended family on a long journey west and south, from Ur in Chaldea through the Haran mountains/valley to Beer Sheva in the Sinai desert. Though only briefly described in the biblical text, that settlement marks an origin for Jews, followed by a history of habitation, recurrent dispossession, dispersal, and return. Home is longed for and abandoned, elusive and occasionally achieved. The Exodus story, in contrast, describes a lengthy, forty-year migration from Egypt to Israel, marked by argument, disobedience, internal struggle, as well as achievement. 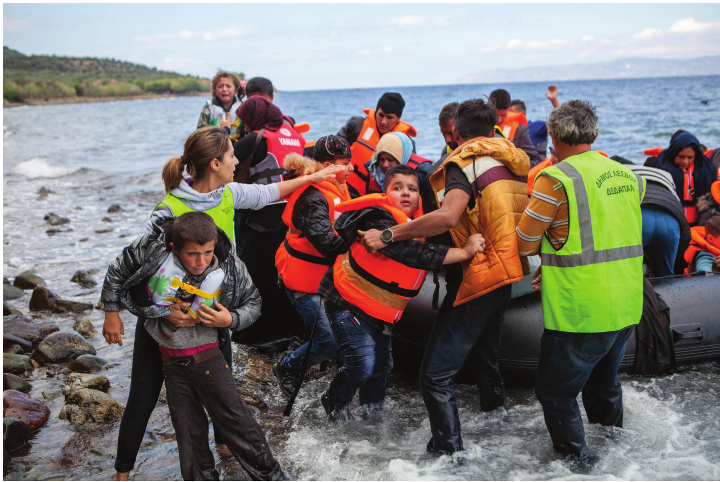 Migration's success is the move from disruption to resettlement and continuity. With it comes collective memory and sagas, like those told in Genesis 12 and Exodus 1 and 12, and in the Passover seder narrative of disruption, flight from Egypt, and lengthy journey to a Promised Land. As a legacy of Ellis Island immigration procedures, photography came to be the documentary tool of displacement, migration, and resettlement. Today, the camera provides immediate international witness to war-torn Syria and North Africa and the exodus of Muslim people to quasi-refuge in Christian Europe and America. Stalled by immigrant quotas, adrift and drowning in rough seas, and packed into temporary camps, their desperation is caught by the camera's witness, and widely displayed as news. Who has not gasped at images of a dead children on a beach, refugees swimming to shore, (fig. 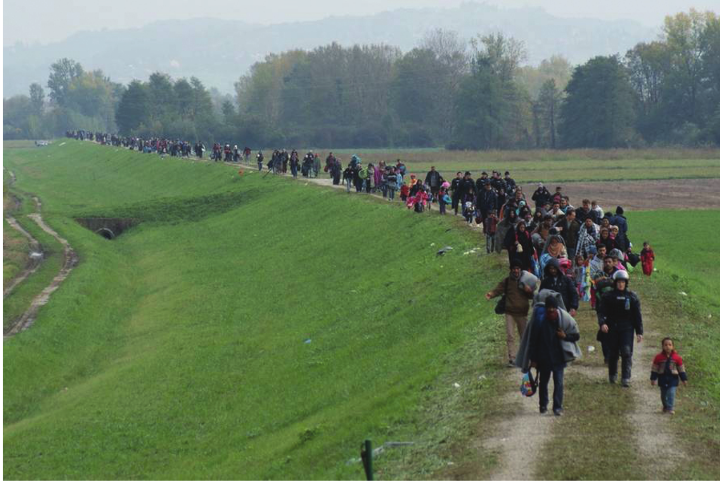 2) and an endless line of determined refugees marching through Slovenian fields. (fig 3) This is migration in devastating detail and incident, with little resolution or end in sight. Fig. 3 Migrants crossing field. Rigonce, Dobova, Brežice, October 2015. Republic of Slovenia Ministry of Defence via Wikimedia Commons. 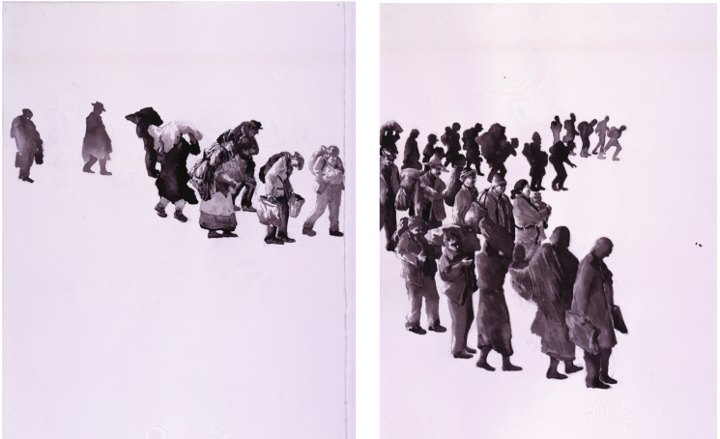 Unlike the immediacy of photographic capture, drawn and painted images of migration have a more symbolic impact. These are often migrations of the past, their histories foundational and iconic for people once in flight, and their representation is commemorative rather than documentary. Rather than news, they are reminders of human upheaval and focused perseverance. Unlike the photographic record, no specific site or incident marks migration's endless crowd. The peasants in Honoré Daumier's mid-nineteenth-century paintings, lithographs, and reliefs (fig. 4) move through an anonymous landscape that once supported their labor and livelihood, now displaced by machines and factories. What history viewed as progress is represented as upheaval and uncertainty. Fig. 4 Honoré Daumier. 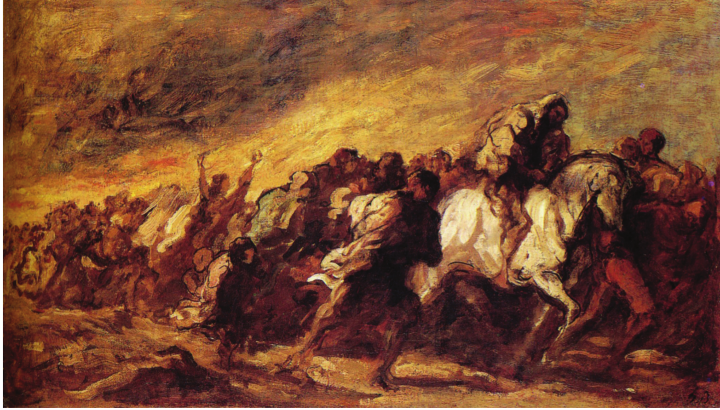 Les émigrants, c.1868. Oil on canvas, 15 x 26.75 in. The Ethel Morrison Van Derlip Fund, Minneapolis Institute of Art. Jacob Lawrence's 1941 series of sixty paintings details the twentieth-century migration of black Americans from the rural South to industrial North. The picture sequence is not a linear narrative, but rather a kaleidoscopic depiction of neighbourhoods, housing, workplaces, and transport; they offer both history and a sense of promise to replace what is left behind. The migration gained in momentum (fig. 5) shows a procession of figures moving north on the canvas; they are joined by another group of emigrants moving east, their directions charted by the picture frame. Seen from an omniscient position above the crowd, the image describes both social phenomenon and spectacle. Fig. 6 Lenny Silverberg, Migrants, ink wash drawing. Published in Crossing Borders, 2010. Courtesy of the artist. With their directional design, such pictures invoke migration's urgency: the move from some abandoned origin toward an uncharted goal. And like the documented incidents of migration photographs, we see neither start nor finish; no beginning and no end. In Crossing Borders, Lenny Silverberg's ink wash drawings picture migrants moving east across pages shared with Steve Kowit's poetry. The texts tell of remembered friendships, and strangers marching by. Silverberg's images are pictorial company for these texts. (fig. 6) Grayish tonal variations lead across the silhouetted forms. Bent and burdened as they file past, these migrants are poorly dressed in baggy clothing, slightly exotic in toques and shawls. A bent old man staggers along with his bundles, a woman cradles a baby in her shawl. Further in the distance, misshapen silhouettes invite a lingering gaze that pauses the rhythm of the line, moving through these pages to somewhere unseen and unknown. The current Syrian migration, though largely documented in photographs, has also produced its painted icons. Tunisian-born Slim Fejjari, whose adopted country Italy was a first haven for boatloads of migrants, compressed the experience into a simple and chilling design. (fig. 7) Seen from above—an omniscient viewpoint that leaves no room for intervention—the crowded vessel is dwarfed by the surrounding sea, whose waves curl like ferocious eyes around the tiny boat. 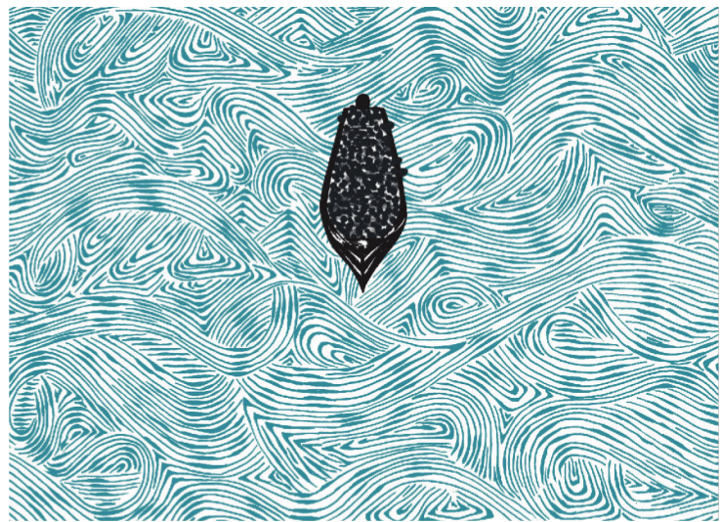 Less than halfway down the picture space— reinforcing a sense of slow movement— the boat plows on to an unseen shore. Fig. 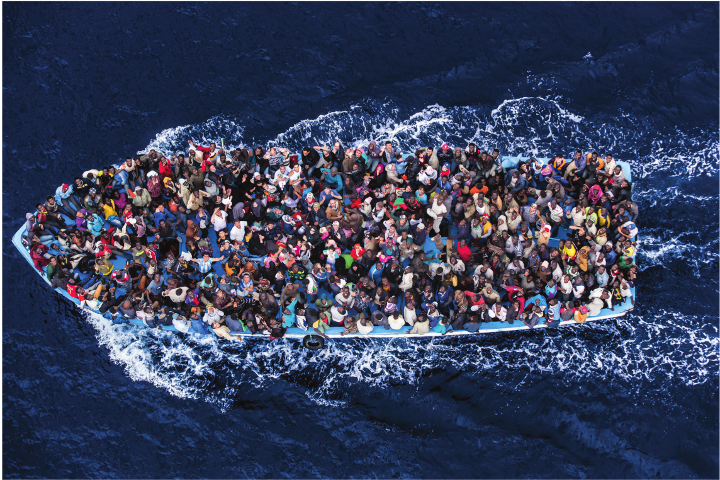 8 Migrants in boat (aerial view). Rescue by Italian Navy, Mediterranean Sea, Italy, June 7, 2014. Photo by Massimo Sestani. We may compare the painting with a photograph, similar in design. (fig. 8) Here, the vessel fills the frame and moves laterally from east to west, like a great fish outlined in waves and foam. Countless figures pack the boat; staring up at us, they draw the airborne viewer into their midst. Unlike Fejjari's image of vulnerability, the photo focus brings a force to the crowd and suggests the magnitude of the migrant journey. The separation of photographic and hand-made images is my own somewhat arbitrary division. They offer, I suggest, two varieties of visual record and experience. The photographs document a specific disaster, human loss, and potential or partial rescue. They are irrefutable evidence of the pain of changing home. The drawings and paintings tell another more general human plight. We see no rushed departure, no arrival, no happy ending; the slow march continues, as from the depths of history. The pictures pause the journey, with neither certainty nor end in sight. 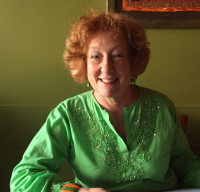 Carol Zemel is professor emerita of Art History and Visual Culture at York University, Toronto. Her work focuses on Jewish and diasporic issues and on the ethics of visuality in modern and contemporary art. Her recent book is Looking Jewish: Visual Culture and Modern Diaspora (University of Indiana Press, 2015). Her critical essays have appeared in Images, C Magazine, Canadian Theatre Review, and the Jewish Daily Forward.